Today I want to share a story I received this week via email from a meditation student and retreat attendee. When I first read this story and shared it with my husband, I experienced an expansive and deeply moving joy arise within me. To protect the privacy of my student, I haven’t used her name, though I can tell you that English is not her first language and she is a couple of years off celebrating her 60th birthday. I was delighted when she decided to share her experience with meditation and the changes she is noticing in her inner and outer life. At the request of the author, I have made minor edits to help the story flow. I hope you too can hear the gems within this wonderful woman’s story. I want to write to you to tell you how much I appreciated the Meditation for Women class. I am gradually falling in love with mediation. Since I moved to Perth in October 2002, I have prepared myself to learn every moment I can. Firstly to help me survive in an English speaking foreign country, secondly to rebuild my life in a comfortable way and thirdly for my career. Luckily I have met a lot of nice people and have receive many opportunities. I have a good job and have been working since I arrived in Australia. I have always been proud of my five year planning habit; measuring the progress and assessing my achievement from time to time. Over the years, I have been a supportive wife. I have also helped my sister (who lives in Hong Kong), by taking care of her two children, who are now studying at Universities in Perth. Yet one day last year, I realised something was wrong and I wasn’t quite like myself. I worried often about my niece and nephew’s academic achievement and future development as well as their changing behaviours. Since they arrived in Perth I often wondered why I received no feedback or appreciation from them. Even though I have helped them a lot. My husband is a high achiever and is faced with a lot of challenge in his career. His mood goes up and down, with depression and anxiety. I am the eldest sister in the family. I am use to taking the lead and making decisions. I know if I don’t do it or move forward, it will fall and I want a result. I have always put everyone before me and I was not sure whether they really appreciated me or not. Over the years I have given up many of my interests, particular in learning Japanese. I even gave up my study room after my nephew and niece came to live with me. Since last year, I have realised I lose my temper easily, complaint a lot to everyone and feel very sad. That was around the time I attended my first Peaceful & Present meditation retreat. This year I also decided to join the Meditation for Women class and I have read a few books about mindfulness, stillness, Zen and Wabi Sabi philosophy. I started to learn to put myself first. As a woman we give up a lot for others, so now I give myself a little moment every day, either at work or home. I’d don’t plan too much into the future, just focus on the present moment. These are the reasons that led me to the 6 week meditation class and why I enjoy it so much. I’ve learnt to not worry about my nephew and niece too much, as they are an adults now and should have their own choices in life. I think I learned this from other ladies in class. Three weeks ago, my husband decided to go back to UWA for his Masters in Architecture, a totally different discipline from his accounting professional career. In the past, I have always support his decision yet still more or less I will worry. However this time, I am not. I feel he needs to do something he enjoys, and at least to give it a go. I told my husband that we need to focus on and enjoy the present moment. That he can give himself a chance to do something that he has always been interested in. I’ve discovered that the measure of your success is not just based on your career achievement. It also includes your health and other matters. I feel an inner peace myself this time and I look forward to our next class. For a few years now, I have had the pleasure of witnessing myself, my children, mentees and students grow a new perspective towards themselves and their life challenges. When a woman deepens her awareness of her cyclical nature and her four bodies (physical, mental, emotional and energetic), she can access both the practical tools and her intuitive wisdom, to better navigate the ebb and flow of daily life. 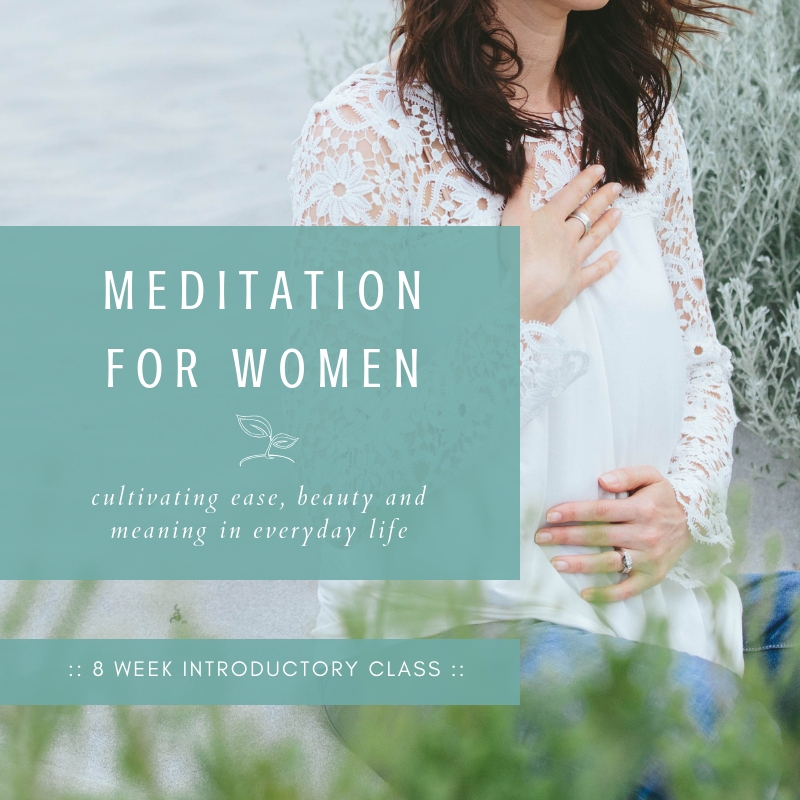 When I followed the inspiration to offer an introductory meditation class specific to women and their cyclical nature, a part of me knew this class would be unlike anything modern culture teaches women. Yes it’s a little different to a traditional meditation class. It’s an open doorway to a softer, kinder way of being. Together we practice, we play, we get still, we move, we chat, we explore our cyclical nature and how our energy and emotions continualy shift. We practice noticing these shifts in daily life. Most of all we learn from each other and we allow ourselves to be real. I am still brewing on the possibilities here, yet one thing is clear; when women have a safe space to discover what meditation can look like for them, old beliefs begin to shift. New ways forward reveal themselves. Feelings are acknowledged. A kinder voice arises and the capacity to hold steady through chaos, becomes a real and tangible life skill. A new round of Meditation for Women will commence May 9th and class has been extended to run for 8 weeks. Today registration is open and limited to 10 women, therefore if this is calling you, I invite you to secure your spot. Previous attendees are welcome to re-attend and build upon their inner practice to cultivate more ease, beauty and meaning in daily life.